Goulds Pumps CentriPro “SPD Plus” variable speed, constant pressure pump controller is designed for the professional pump installer. With application specific features and CentriPro designed software, the SPD Plus was developed specifically for commercial above ground centrifugal and submersible well systems. This variable speed controller goes beyond a “standard” drive, giving the pump professional a rugged design that is built for demanding conditions. The SPD Plus pump controller is a simple, easy to use and commission Variable Speed Drive (VSD) designed specifically for use in submersible or above ground pump systems. The SPD Plus features an integrated Start-Up Assistant which simplifies system commissioning and setup.It is designed to work directly with centrifugal and submersible pumps with ease. SPD Plus has the true motor match feature which allows a 100 HP SPD Plus to run a 100 HP pump efficiently. 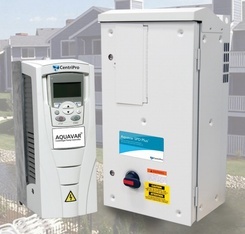 Goulds Water Technology is an industry leader offering pumps and pump controllers with advanced technology, proven reliability, and full service on a complete line of products.